The afternoon was divided between Division 3 and Division 1 with individual favorites Bowen Martin (Page), and Samantha Schadler (Rio Rico) looking to finish their interscholastic high school cross-country careers with individual titles as Seniors. In the D3 Boys race, Martin shot up to the front and led teammate and Morgan Fowler (Sr.) through the fastest mile of the day, both of them under 5-minutes. Martin broke free shortly before the mid-race hill with Fowler still in tow. Roshan Tinoco-Miranda (Rio Rico, So. ), Trent Holiday (Page, So.) and Isaiah Honyumptewa (Chinle, Sr.) followed next, each making moves determined to hold position with the leaders. Martin's choppy strides carried him through the remainder of the race to clinch the victory in 16:02 which would stand as the fastest time of the day. Fowler and Holiday steadily cruised in for second and third around 18-seconds apart from Martin and each other to deliver the first six points to the Sand Devils. Honyumptewa punched in at 16:43 for 4th place behind the Sand Devil trio. Aaron Simien (Tuba City, Sr.) and Connor Dosmann (Arizona College Prep, Sr.) both reeled in over 10 people to reach top-seven finishes, along with Jonathan Lane (Walden Grove, So.) who had also moved up six places. Alec Almendarez (8th - Jr.) and Lissandro McCarter (9th - Fr.) led the charge for the Prescott Badgers as the Sand Devils top challengers at Cave Creek, while Abraham Valenzuela (Palo Verde, So.) rounded out the top-ten finishers clocking in at just under 17-minutes. Skyler Sandoval (Jr.) finished 13th and Lance Harris (Fr.) 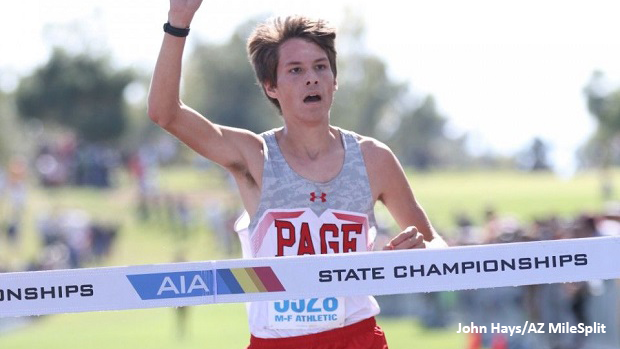 placed 18th just ahead of their teammate Kaipo Uejo (19th - Sr.), to shut it down for the Sand Devils for a total of just 35 points take their fifth consecutive State Title. The Prescott boys finished 2nd with 114 points over Salpointe Catholic. Next: Schadler strings out the pack and Salpointe comes out on top.